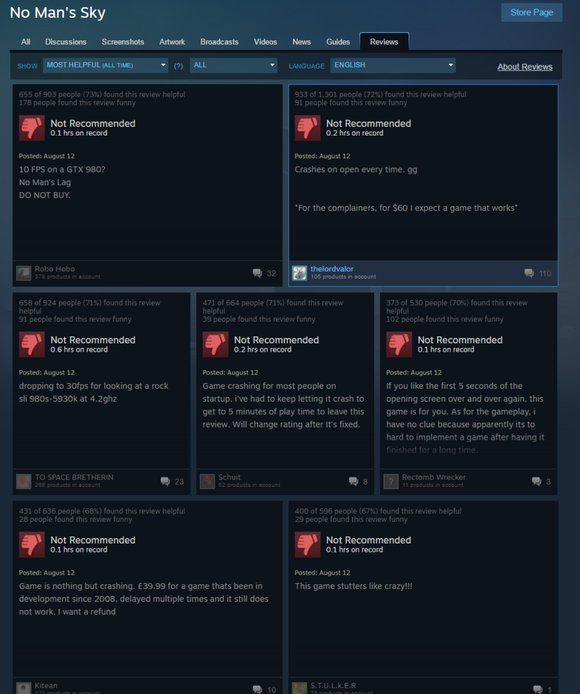 The above excerpts are taken from a scattering of No Man’s Sky ($60 on Steam) Steam reviews, as of launch day. The game went live at 10 a.m. Pacific this morning and is currently sitting at a “Mostly Negative” rating, with the accompanying red thumbs-downs as far as the mouse can scroll and users citing everything from crashing at start-up to crashing during the game to frame rate dips and even freezes. The issues aren’t quite universal, but they appear to be fairly widespread. The PlayStation 4 version ($60 on Amazon) isn’t affected by the same woes. The top No Man’s Sky reviews on Steam. Me? I’ve played about ten minutes and can confirm it’s pretty busted. The game stuttered a bunch at launch, but I did manage to finally make it into the game—and, after turning off Vsync and removing the arbitrary 30 frames per second cap, I even got it running at a respectable 72 frames per second. As long as I was standing still, that is. If I turn the camera the entire game locks up though, sometimes for up to five seconds at a time. Audio also seems to be glitchy, with some sort of unearthly low-pitch hum and crackle interfering with the game audio on my system. And make sure, if you do get it running, that you turn it to Borderless Window mode. Otherwise you’re likely to Alt-Tab out and never be allowed back in. Hello Games has already pushed a patch for the game. Developer Sean Murray has also taken to Twitter to remind users to use the latest drivers available from AMD and Nvidia, and make sure that you have Visual C++ Redist 2010 installed. We’ll keep you updated. 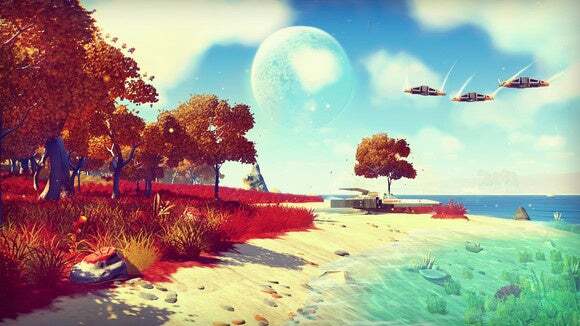 Hopefully these are just launch-day hiccups that’ll soon be sorted out by Hello Games. Then it’ll be time to sort through the rubble left by the No Man’s Sky hype train and see what’s left.